Can I Use a Cow Stanchion for Grooming? Cattle stanchions, consisting of two or more vertical bars, are designed to secure a cow for feeding, milking or providing medical care. They are not designed with grooming in mind. Although you could groom a cow in a stanchion, not all grooming techniques will work in such a limited space. Additionally, cows are more prone to aggression after release from a stanchion. There are other options for securing your cow during grooming, most of which are better options than a stanchion. Because of a stanchion’s design, it may be difficult to completely groom a cow or other livestock in one. The areas around the head, neck, shoulders, and front legs will be difficult to reach, as the cow’s head will be disappeared into the stanchion, leaving her with limited mobility and you with limited access to her front end. The rest of her body will be exposed and can be groomed. 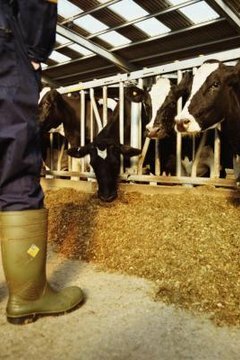 The "Journal of Dairy Science" published a scientific study on the effects of using self-locking stanchions. Holstein cows were restrained in self-locking stanchions for four hours each day, as scientists measured their attitudes and behaviors. Overall, self-locking stanchions did not significantly reduce a cow’s food yield or intake, but it did result in increased agitation. The longer the cows were stationed in the stanchion, the more aggressive they became. For groomers, this indicates a need for fast grooming so cows aren’t left in the stanchion long enough to become aggressive. The standard method for grooming cows is to utilize a grooming chute. A grooming chute has a completely open frame design, allowing you to easily access all parts of your cow. Cows are docile creatures who will typically remain calm while you groom them. The grooming chute doesn’t have many restraints, so this should significantly reduce aggression when compared with stanchion grooming. You can build a grooming chute yourself or purchase one from a farming supply store. The University of Kentucky’s College of Agriculture reports that cows are more comfortable in freestall barns. Freestall barns are larger than standard barns and provide a comfortable resting area for cattle. Research showed that cows have decreased behavioral stress, as well as an increase in milk yield and other positive behaviors, when they reside in freestall barns. For groomers, a freestall design allows you to enter the stall with a cow and groom from within its confines. Use a rope, around the cow’s head, to keep him secure while you groom his body. Do Cows Ever Bite Humans?